Can you spot the MacBook Air? 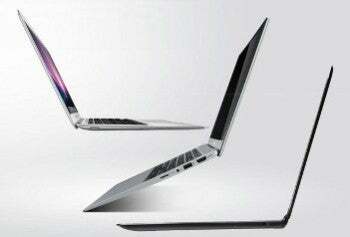 Which model comes from Apple, and which are from Acer and Lenovo? Apple is not taking part in the 2012 Consumer Electronics Show in Las Vegas but is present at the trade show through rip-offs of its products. From MacBook Air-inspired ultrabooks, to iPad-like tablets, smart TVs, and cloud computing technology, you will find clones of Apple’s product lineup at CES 2012 – and this is just a taste of what’s coming up at the show this week. Ultrabooks, thin and light laptops, are expected to be the big thing this year, and unsurprisingly most of them look more or less like a MacBook Air, except they run Windows. Manufacturers are trying price their ultrabooks below the MacBook Air, with Samsung's $900 Series 5 ultrabooks as an example. Lenovo’s ThinkPad laptop line for 2012 is not far off from the now-classic MacBook Pro design, either, and its ultrabook IdeaPad 300 is just as similar to the MacBook Air. Oh, and Acer and LG are on the ultrabook bandwagon, too, joining other vendors that are expected to introduce as many as 50 ultrabook models at CES 2012. Android tablets didn’t manage to overthrow the iPad from the top seller spot in 2011 -- in fact, they barely managed to nudge it. So this leaves plenty of space for tablet manufacturers such as Toshiba, Acer, and Samsung to have a go again at tablet designs, making them as thin as possible and hoping Android 4.0 will fill the software gap to give them an edge over the iPad. Meanwhile, Vizio is not shy admitting that it wants to emulate Apple’s computer line with new laptops and all-in-one desktops at Dell prices. Some manufacturers are so eager to push ahead of Apple that they even prepared products based apparently on nothing more than rampant speculation about the unreleased and unannounced Apple TV set. Lenovo’s smart TV runs Android 4.0 for apps and includes voice control and console-quality gaming capabilities, as well as flicker-free 3D capability. Lenovo’s smart TV debut will join other Google Android-enabled TV sets from Samsung, LG, Sony, and Vizio, hoping to they beat Apple to its TV strategy. Apple’s iCloud cloud computing technology was also inspiration for some of the companies exhibiting at CES 2012, who are trying to integrate software services with their own lineup of hardware. Acer’s free cloud service, dubbed AcerCloud, will allow people to upload all their images, video, and documents to Acer’s servers and access them over the Web from any PC, mobile phone, or tablet running Windows or Android. In fact, Acer ripped off Apple’s iCloud and even used its slide wholesale (aside from the font) as The Verge points out. Don’t get me wrong, it’s great that these manufacturers get "inspired" by Apple and give consumers access to similar technologies, usually for considerably lower prices. But as often occurs with CES announcements, probably more than half of these Apple rip-offs will never end up in consumers’ hands. The project may be spiked by the vendor, or the product ships too late to matter anymore. Just because they resemble an Apple product doesn’t mean they are of the same quality; and consumers are increasingly aware of this, as shown by the continued dominance of the iPad and iPod in their market segments.